Memory is treacherous. Yet, I seem to remember rather vividly a time when our politicians talked about a project they called our ‘common European home’ (Mikhail Gorbachev) or envisioned a ‘Europe, Whole and Free’ (George H. W. Bush). Common European Home. Under new management. – Image source here. I liked that idea at the time. I liked it a lot. But the world has come a long way since. The image still applies, if in a rather depressing way. At present, the common European home appears to be ruinous, with many a tenant who is teetering at the edge of bankruptcy, with its flats and apartments privatised, managed by a bunch of greedy, bullying property sharks, who in turn act on behalf of supranational banks and corporations that, of course, prefer to remain anonymous. The property sharks as well as their contractees are interested in a single thing: their profit. They do not have any interest in the upkeep, modernisation, or development of their property. They don’t seem to care a great deal about the way in which the tenants may get on with each other, and they certainly don’t care about the relationship with their neighbours, especially if they are poor and don’t have any valuables. Like those people who live in the poor house next door, from where time and time again inhabitants hope to gain access to Europe’s sacred hallway). Any acknowledgement of the fact that everything hangs together? Not a chance! A rare sighting: the property shark. – Image source: http://kreuzberged.files.wordpress.com/2014/01/business_shark_1.gif. In December 2001, my wonderful colleague and friend Almut-Barbara Renger, back then a lecturer at the University of Greifswald, organised a colloquium ‘Mythos Europa: Vom Stier zum Sternenkranz’ (i. e. ‘Myth Europa: From the Bull to the Ring of Stars’). A conference volume containing some of the papers has since been published, alongside a fine anthology, covering the Europa/Europe myth from Ovid to Heiner Müller. I did not submit my own insignificant little piece at the time, as my paper was concerned with mentions of the Europa myth in the Latin inscriptions – and there hardly are any at all. The material was too scarce to draw major conclusions, and it would have been an ill fit for a collection of otherwise meaty contributions. But my material comprises two items in particular which, I believe, are timely to present in the present situation of Europe. 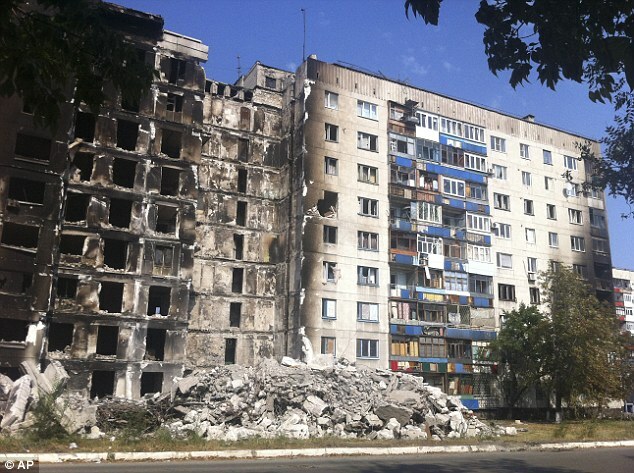 A Europe, in which there is a war going on in Ukraine (does anyone even remember the Crimea? ), in which Greece is slowly being bled to death by European leaders who are barely leaders and certainly not Europeans, and in which an ever-increasing number of poverty-stricken African immigrants must try to find a better future in Europe, many of whom drown on their way to our shores, while the survivors are treated with contempt for the insane idea to wish for a better life? Time for a deep breath. Time for contemplation. Time for culture. Time to seek refuge and wisdom in the imagined world that is Graeco-Roman mythology. The single most impressive reference to the Europa myth in the Latin inscriptions comes – oh the irony of it! – from Britain. Lullingstone mosaic. 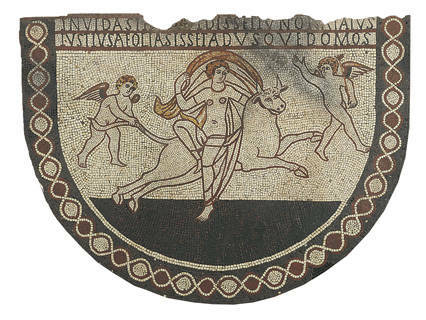 – Image source: http://www.english-heritage.org.uk/content/properties/lullingstone-roman-villa/lullingstone/lullingstone-research-023.jpg. iustius Aeolias isset ad usque domos. she would even more rightfully have approached the halls of Aeolus. To me, this inscription is a piece of beauty (and relevance!) for two reasons. First, I enjoy the almost feminist voice of it: no understanding for Zeus, just an emphasis of how right Juno was in the first place (and how much more justified still she would have been, had she witnessed the bull’s incompetence). Secondly, I find it striking that, in spite of the change in perspective, one thing does not change: Europa does not appear to have a will of her own in this scene – she is a sport of Fortune, torn away and risked as a plaything of the powerful and (al)mighty. Europa is the object of desire, of jealousy, of the entire (despicable, disturbing) affair. Does the bull not stand as an image for the financial market? Could Juno be an image of the hopeless political establishment? What does the sea symbolise? The moral abyss all of us are facing, if we don’t help to preserve and save Europa, perhaps: if we fail to see that the only actual victim in this form of power play is the abducted girl, if we fail to see that we ourselves are actually that abducted girl? A troubled sea is best navigated with a trusty vessel, of course, and the image of states as ships that require navigational skills and courage (both slightly higher than those of Captain Schettino, preferably) is an ancient one – as is the idea of all of Europe as a ship. 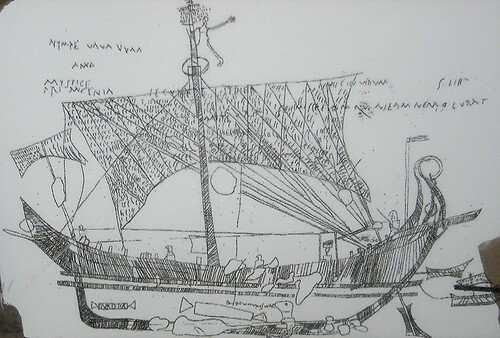 Pompeii: Ship Europa. – Image source here. The name of the vessel is inscribed in a winged tablet to the left. The Europa is a cargo ship, and one can just about make out, to the right, a little ship that is attached to it: is that the rescue boat, to be used in case of an emergency? If so, would everyone fit in? How many would? Who would? And in which order? Again, Captain Schettino may not necessarily be a particularly good role model in that regard. One wonders where the trusty old vessel is headed these days. One can only hope that, next time we take stock, everyone is still aboard (and willing to lend aid and comfort to shipwrecked people that we encounter on our journey), and that the ship has not pulled a Costa Concordia and gone belly-up. Right now, I am significantly less optimistic than I was back then, when politicians still dared to dream about a common European home. That was where I wanted to live, not the ramshackle hut that it since has become. This entry was posted in Carmina Epigraphica, Epigraphy, Poetry and tagged Big questions, Carmina Latina Epigraphica, Europe, Fortress Europe, Imagery, Mikhail Gorbachev, Mythos Europa, Pompeii, Poverty, War and Peace. Bookmark the permalink.